Conditions weren't the best today - cold, persistent wintry showers and the river running high. 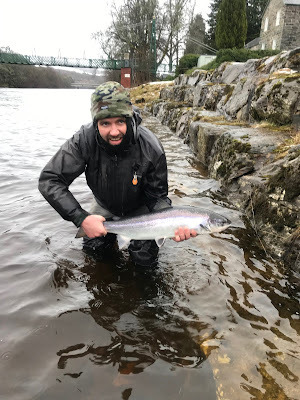 Graeme Lightbody persevered, though, and was rewarded with a superb fish of 9lbs caught on the spinner on Port-na-Craig bank this afternoon - a great result and following on from the two he caught a couple of weeks ago - well done. With more settled weather forecast and good numbers of fish about prospects for next week look good.